6 Yards Plus is a new saree adda in Kamalapuri Colony in Banjara Hills. This home studio is packed to the rafters with sarees, readymade blouses, and fabric. Run by Mrinalini Shastry, 6 Yards Plus is definitely the kind of place where both millennials and older generation can pick sarees. And that's no normal feat, considering how mothers and daughters always have differences when it comes to buying a saree. This home studio is quaint and as you walk in, you'll find everything well categorised. The readymade blouses section was the first thing that caught our eye. From checkered blouses to ikat ones, quite a few pieces stood out for us. These are perfect summer wear and are priced at INR 370 upwards (Psst. you can wear them as crop tops too). The Bengal cotton sarees take a place right under the blouses aisle, and if you're planning a surprise for your mum, you might want to check their collection. While you're at it, don't forget to pick a cotton saree with tassels from Bengal for yourself. We are sure you've spotted Samantha rooting for Gollabhama Sarees —traditional Telangana Handloom sarees. 6Yards Plus has a fine collection of those, which we're going to pick for ourselves. The adda curates sarees from different parts of India and some of them are designed in-house. Right from popular Uppada silk to the lesser-known (but stunning) Goan Kunbi pieces, there is a wide range for you to pick from. But hey, don't forget to chat with Mrinalini to know a thing or two about the history of these sarees. To say she is passionate about sarees is an understatement so you're in for a conversational treat, fo sho! Want some quirky blouse pieces? 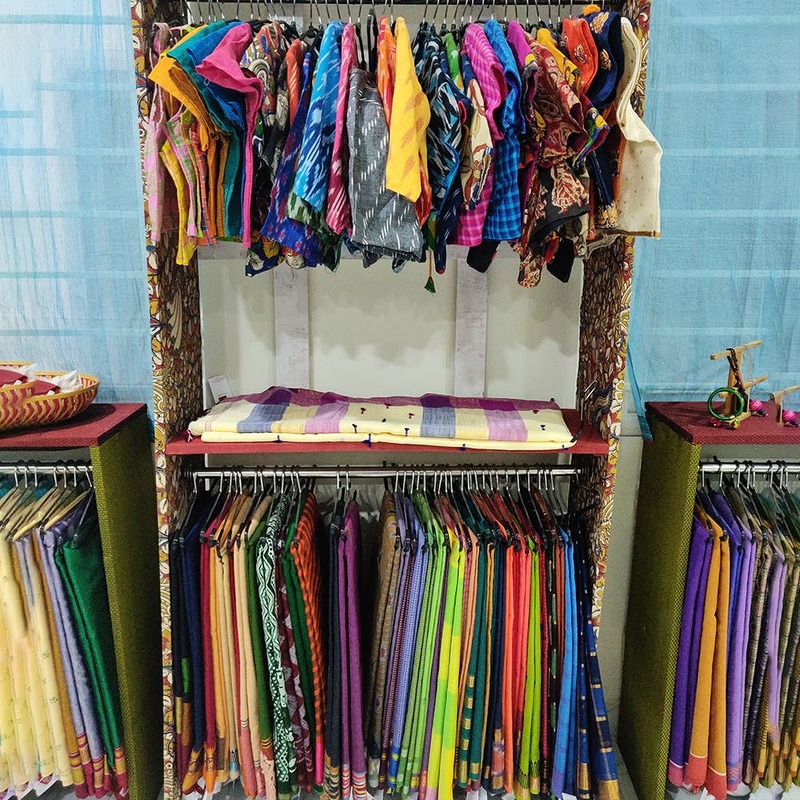 An entire shelf is just dedicated for fabric, and you'll find Khadi, Khunn, Uppada Silk, Kalamkari, and more. The price range per metre is between INR 300-900. Right at the entrance, there is a waiting room that is stocked up with books on sarees and games like Pachisi. Feel free to pick a book or gawk at the Kondapalli Bommalu as you wait.